▶ SoldThis listing was sold on Oct 25, 2018 for the price shown here. European style brick & stone home w/unique features - diamond pane leaded & stained glass windows, stained glass french doors lead to front porch, arched entry door w/stained glass accent, vintage light sconces, arched doorways, vitrolite tile, brick & stone arched driveway entrance, gleaming hardwood flrs, & more. 3 bdrms, 2 full baths, updtd KIT, partially finished LL, newer electrical service, walk out basement, freshly painted. 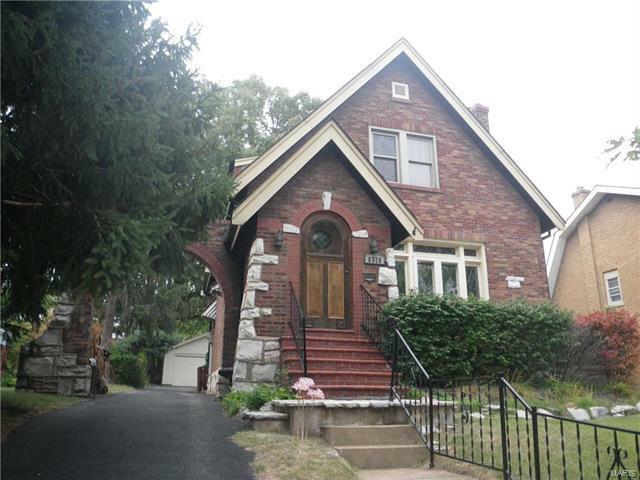 Arched front door brings you into a tiled foyer leading to spacious LR w/b brick FP (sold in AS IS condition), stained glass windows, original sconces, gleaming hardwoods. KIT boasts vitrolite tile, custom cabinets, gas range, D/W, fridge (remain in current condition). Upstairs find two spacious bedrooms each with 2 closets and ceiling fans. Full updated bath w/subway tile, contemporary vanity. Partially finished walkout LL w/full bath. Relax on your patio or front porch! 2 car garage. Walk to UMSL! Hwy 170 to east on Natural Bridge to Right on Clearview (Bel Nor entrance), to right on Knollwood to home on right.